Today we’re focusing on favorite frugal meals for Frugal Tips Friday #3. I don’t cook a lot. It seems I’m always so busy I just eat what’s fast. And I need to do better. A quick frugal meal for me is an egg salad sandwich. Toasted bread with egg salad made of 1 egg, mayonnaise, diced sweet pickle and seasonings like onion powder. I typically fix baked beans to have with my egg salad sandwich and then I have baked beans for days or possibly a week. Another quick frugal meal for me is a veggie burger. I put one in my electric skillet. Then when it’s about done I put the two halves of my hamburger bun in the skillet with it to brown them as well. I add mustard and dill pickle slices to my veggie burger. Sometimes I add a slice of cheese. And in the summer I add tomato slices, lettuce and sometimes an onion if I have them. I also like baked beans with my veggie burger. So there’s another use for my baked beans in the week I have an egg salad sandwich. Sometimes I’m hungry for an all veggie meal. I might have a salad and two or three veggies. A baked potato is a good filler with margarine and sour cream and chives. Then I add a hot roll or fix some cornbread. I’m a beans and cornbread and sweet tea kind of girl! As you can see, I don’t go to a lot of trouble. I eat pretty simply. So what are your favorite frugal meals? One of you mentioned bulk meals, so maybe that is your favorite frugal meal. Or freezer meals or both. You could add that here as well. 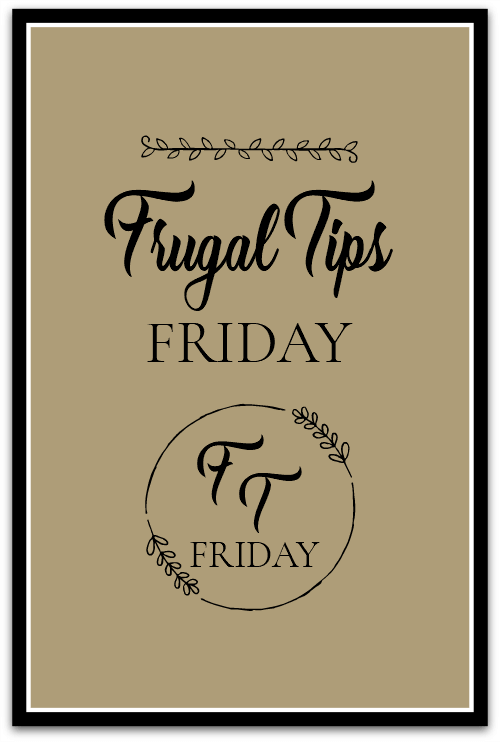 Would also love suggestions on future Frugal Friday posts. Diced chicken, carrot and and celery is the basis of a lovely stew or pie filling. There are plenty of recipes on the ‘net. Start with one of those with not too many ingredients. If the quantity says 4 or 6 portions that’s OK.
Day one: make entire recipe and have one portion with a jacket potato. Day two: divide the rest into portions. Freeze all bar one which will become chicken noodle soup – just by adding a cup or two of water or chicken stock (half a stock cube) and some very thin pasta or baby shell or stars pasta and bring to the boil, then simmer until pasta is cooked – 2-3 minutes. Other days: defrost a portion and add a flavour – maybe curry and add cooked rice; maybe oregano and add big pasta….. endless fun! My main problem is a small freezer above my fridge. Brenda I too have a small freezer above my fridge. I don’t us containers anymore. Soups, homemade baked beans, any casserole mixes can be stored in zip lock plastic bags. Open the bag, put it inside a bowl. Put your ingredients in. Seal the bag and put laying down flat in your freezer. They don’t take up much room and as the ingredients are cooked through, the bags can be washed and used over. That’s what I do. I don’t have room for containers. You can’t beat rice and beans for being cheap, plus healthy PLUS good for the environment. I like saffron rice with Cuban-style black beans cooked in coconut milk, and spinach on the side. I haven’t had beans and rice in a while. Will put this on my menu! Here are a few of my favorite meals. I make a pot of chili from scratch using dried beans which I cook in the crock pot ALONE until tender, then add canned diced tomatoes, a small can of tomato sauce, a sauteed chopped onion, and sometimes celery, and some spices. I also brown 1/4 lb of hamburger and add it. I cook it all on low in the crock pot until dinner. I freeze the leftovers after a couple of days for those times I don’t feel like cooking. Another favorite is bean tostadas. I use the crispy flat corn tortillas you buy in a package, spread refried beans on top, then chopped onion and tomato, some shredded lettuce, hot sauce and sour cream. I chop up the onions and tomato and lettuce beforehand, and store in the refrigerator in Pyrex storage bowls. Quick and so yummy. I can eat them for several days. I like making spaghetti, used to do it from scratch, now I use canned spaghetti sauce, brown some hamburger, add some extra spices and a can of mushrooms. Served over pasta, it is delicious. I freeze the leftovers for later. I often make homemade soup. I saute and onion, then add beef broth mix. My favorite is called Broth Base and Seasoning by Orrington Farms. It comes in a jar and you only mix two level teaspoons to a cup of water. The broth is delicious! I then add a can of white potatoes which I chop into smaller pieces, and a can of carrots, and any other vegetables I feel like having. Cook it for about 20 minutes to combine the flavors. Add any favorite herbs or spices. It is very tasty, even without adding meat, but sometimes I add about 1/4 pound of browned hamburger. I buy a pound of hamburger and then divide it into 4 pieces and freeze individually. I only need a small amount of meat for just myself. I can eat this soup for days and not get tired of it. These days I am into quick and easy stuff. I am a firm believer in a stocked pantry. I buy my canned basics at a warehouse store called Winco. You have to bag your own groceries, but the prices are amazing. They have a large bulk section and I purchase my dried beans, etc, pastas, oatmeal, and spices and refill my containers at home. I save a bundle this way, and no matter what happens, all I have to do is open my pantry and decide what I want to cook next. I eat oatmeal for breakfast most mornings and add raisins and walnuts which I also buy in bulk. I recently discovered that milk is sold in cartons which you do not have to refrigerate until you open them. I only use milk on cereal or in recipes so it is great to be able to store milk in my pantry. Patrice, you always have good ideas! I think a rotisserie chicken from the grocery store is a great deal for about $5. Leftovers can be used for fried rice with a few veggies; chicken salad; burritos with refried beans and cheese; or tossed with a spoonful of pesto with thin spaghetti. I have thought of doing this, buying a rotisserie chicken. I think I’m going to try this. Brenda, you can get at least 5-6 meals from one chicken. Always save the carcass, (freeze it) and later make chicken soup. Very easy and stretches that $5 to at least 6 meals. Ist night I make instant mashed potatoes with butter and chicken and a vegetable or salad. Next I have the legs or thighs for a meal. Then I shred some of it off the bone and save in a baggie and make chicken tacos or enchiladas. then the last bits are saved and boiled with the carcass for chicken soup. So yummy! with the rotisserie chicken and use it in casseroles. They can be refrozen also. However, I’ve never used the carcass for broth and can’t believe I’ve never thought of it! lol I also make chili and freeze what’s left in portions suitable for hubs and me. I always put the carcass from the chicken in my crockpot, add water, couple of stalks of celery, whole carrots and an onion to make broth. I don’t even cut up the veggies. I cook it all night and in the morning I strain it. You can keep the veggies and cut them up later. I find it easier to separate the bones and chicken bits if the veggies aren’t cut up. We often buy a rotisserie chicken. Have some the first day with microwave steamed veggies ($1.00/bag) and Idahoans mashed potatoes (.99/bag). Second day we’ll have cold chicken sandwiches with either leftover veggies & potatoes or grapes & potato chips. One chicken is usually good for 5 meals. I love the idea of the veggie burger with the add on’s…… Yummmmm…. Living alone… I don’t prepare big meal anymore.. unless, of course the kiddos and family are coming over!! I do love to prepare a big pot of homemade soup and / or stew and store in the fridge or freezer…. so easy to just warm up and maybe add a roll or even tortilla chips!! I wish I had more freezer space! Brenda, if you freeze portions in freezer bags they stack nicely in the freezer. I just have the standard apartment sized refrigerator. I am able to store a lot of meat by dividing and re-packaging it. I can actually store maybe 2 months of meat if I plan it right. I keep frozen vegs on the door shelves. Once in a while I buy whole chickens and roast them and then divide it up for the meals mentioned before. In my last apartment I had a large patio like yours and I bought a small second hand apt size chest freezer off Craigs list for $50. Now they seem to have risen to about $100. I made sure that it worked before I purchased it, and it stored a lot of stuff for me. I kept it on my patio and covered it with a vinyl tablecloth weighted down with a large potted plant. You might check into getting one. I don’t have electricity on my patio. Then store it in your closet. It is only about 3′ square. I make my own version of “Shepherd’s Pie.” It’s a pound (more or less) of ground beef that I buy in 3 pound packs when it’s on sale and freeze after cutting into sections and wrapping in aluminum foil; one package of frozen mixed veggies (your favorite blend) that I can pick up for $1 or sometimes even less when on sale, a can of generic tomato soup (79 cents) and a large recipe of instant mashed potatoes, made with lots of butter and milk as the topping. I cook and drain the ground beef, season with salt, pepper add finely diced onions (I buy a small shake jar at the Family Dollar store), throw in the can of soup (not diluted) and the package of frozen veggies and cook in the same frying pan until steaming. I whip up some instant mashed potatoes (whatever is on sale – one box lasts me quite a while) per the directions on the box plus extra butter because I’m a butter person. Then I put the meat/veggie/soup mixture into a shallow 1-1/2 quart casserole dish, top with the mashed potatoes, and bake in the oven for 30-40 minutes at 350 or until the mashed potatoes have browned peaks. The portions I don’t intend to eat over the next 2 days for lunch or supper I freeze in single service size plastic containers. One casserole dish size “pie” will give me 5 to 6 filling meals. I also frugal shop as much as possible – $1 on sale frozen pot pies. They make a perfect light lunch, especially on cold days like we’re having in SE WI where I live, when I don’t feel guilty turning on my oven. Also will buy $1 packs (on sale, or 10 for $10) of Fettucini Alfredo noodles and sauce, make it up in a sauce pan and add fresh broccoli florets or a can of tuna for a hearty meal. One package will usually give me 3-4 quick meals (with either broccoli added or tuna added) that I pop out of their plastic containers into a bowl that I cover with a plate and into the microwave for a minute or so to heat. I also confess, I still eat (and enjoy) Kraft boxed mac ‘n cheese. I can get those on sale for $1 a box or less, sometimes. I always have a cabinet shelf full of Kraft boxed mac ‘n cheese. I confess I still eat the Kraft macaroni too! When I’m really hungry it’s fast and easy to fix. Your suggestions sound yummy and I will have to try these. Thanks! And yes, the dollar store is a great resource sometimes, but I have found that often I can get the same thing for around 20-30 cents cheaper at my warehouse type grocery store. But I do purchase a lot at the dollar store. I put my pot pie once cooked on rice. I wasn’t sure I’d have anything to contribute – already so many yummy ideas I’m anxious to try. I boil a large pot of chicken and divide freeze portions for future meals. Adding a portion to a pasta or rice side (grocery store brand $1.00 each) and I usually add a handful of frozen vegetables. Those are usually $1.00 each, as well. I also use the portions of chicken on a mixed green salad or just vegies. Same portions of chicken to make a quesadilla (two flour tortillas, chicken and Mexican blend cheese) YUM! On occasion I’ll cook a pound of ground beef with taco seasoning – freezing portions, too. I’ll use a portion to top a baked potato and also top with Mexican blend shredded cheese. Someone mentioned Mac and Cheese – add chicken or ground beef. Oh yes! I love taco soup, one of my favorites. I need to make some soon! Patrice – I’d love it if you would share exactly what’s in your well stocked pantry. Please and thank you! Ist I have invested in Rubbermaid containers, both one gallon and 1/2 gallon sizes. And I stock pinto beans, white beans, lentils and split peas. Spaghetti noodles, linguine, elbow, bowties, egg noodles, etc, and brown and white rice. (In 1/2 gallon containers) Also flour and sugar and brown sugar are kept in the gallon size along with oatmeal. For canned goods: Always about a case ea of diced tomatoes, 8oz tomato sauce, spaghetti sauce, mushrooms,. Cartons of chicken stock, and beef stock, at least 6 of each. Dried chicken and beef bullion, refried beans, ranch beans, green beans, corn, peas, carrots, potatoes for soups. Cans of salmon, chicken, tuna. Cartons of milk. lots of canned fruits. A few cans of olives. some alfredo sauce, cream of mushroom soup, cream of chicken soup, couple cans enchilada sauce. At least two extra cans of coffee. Dried milk for emergencies. Then I also keep stuff from the bulk section: My spices, raisins, walnuts, pecans, sugar, flour, biscuit mix, corn meal, oatmeal, bread crumbs, and egg replacer, (for emergencies). Lots of different herbal teas. I also store at least 4 flats of water)for emergencies) I drink diet coke, so I store 4 cases a month of that. I try to keep two pkgs of butter extra always, and oil which I seldom use. I don’t bake a lot so don’t worry about cookies or cake or pie. I keep jello and use my canned fruit in it. On the first of the month I buy fresh produce for salads, carrots, celery and onion to make a stew with. I buy fresh blueberries when on sale and freeze them myself as I think they taste better than buying them already frozen. I seldom eat eggs so only buy one carton at a time and it usually lasts me a couple of months. I use heavy whipping cream in my coffee as the flavored creamers do not settle right on my stomach. I keep sour cream and cottage cheese in the fridge. I keep bags of shredded cheese and lunch meat. I love bologna sandwiches with mayo, mustard, lettuce, and eat it often for lunch when I am out of leftovers and don’t feel like cooking. I pretty much only keep broccoli and peas in the freezer as far as vegs go. I buy diced garlic at the dollar store. I keep a sack of onions and potatoes in the bottom of the pantry. I used my entry way coat closet and purchased a shelving unit at Home Depot for a little over a hundred dollars. I installed it myself, and the shelves are all adjustable. I keep all the pasta and beans, etc up on the wooden shelf that was in the closet to begin with, and all the wire shelving is below that. So I have to store my coats and vacuum elsewhere. I know there is probably more but I cannot remember right now. I also stock up on laundry and dish soap, tee pee, cleaning supplies, and shampoo, etc. I do not buy cleaning products at the dollar store. I use name brands but buy extra when I see a good sale. So if an unexpected something comes up, if I have to, I don’t buy groceries except for fresh stuff and eat out of my pantry. and like I said I keep a list of my favorite meals on the side of the fridge to help me remember. If I think of more I will let you know. Feel free to ask me questions. I come from a large family and was taught how to be frugal but eat well. I buy some meat, mostly chicken and ground beef, but do have steak once in a while and I love wild salmon. It was an investment at first, but I have saved so much money eating this way. I do not like eating packaged foods, as I don’t like the preservatives, etc in them. So I try to mostly cook from scratch. Now I only have to supplement. I check the pantry before I go to do my grocery shopping the first of the month and tally up what I need to purchase to keep my stock up. And when the local store has a canned food sale, I buy cases and store them in the bottom of my linen closet, under my bed, etc. Living like this has given me a lot of peace of mind. I also have a large pinterest board called Good Food. Under Patrice Shannon and my picture shows me in a bright blue shirt with white hair. I have not tried all the recipes I have saved but once I do, if I do not like them I delete them. Patrice – thank you soooo much for sharing your well stocked pantry. You’ve obviously put a lot of thought in how you keep it stocked and how you utilize what you have stocked. I’m very impressed and hope I can do something similar for myself. I can well imagine the peace of mind it provides. I sincerely appreciate the time it took for you to explain. Thank you! I love having you share! Brenda, if it was just me here, I would eat some kind of sandwich every night! Or I would eat chips and salsa or something else easy like a bowl of cereal! It’s hard to cook for one. But there’s two of us and my husband likes to see all of the food groups in a meal, so we eat more balanced meals than I’d probably fix on my own. He is a good cook and does a lot of the cooking, but he still has a job (I’m retired) so I try to limit his cooking to the weekends, because if he comes home and cooks, he has to chop and dice and do this and that and it’s really late before we finally eat! So I try to have supper ready when he gets home by using the slow cooker or the rice steamer. Others have talked about slow cookers so I’ll talk about the rice steamer because it is so simple to use. It has one button that can be on Cook or Warm. I put rice, couscous or grits in the bottom — usually a cup of the starch and two cups of water — then put some fresh or frozen veggies in the little steamer basket on the top. We might use frozen peas and carrots or frozen spinach, or maybe some fresh cauliflower and broccoli cut in pretty small pieces. Then push the tab down to Cook, and in 15 minutes or so there’s some nice rice and veggies that we eat with some low-sodium parmesan cheese and no-salt Mrs. Dash or Trader Joes 21-Seasoning Salute no-salt seasoning because my husband is on a low-salt diet. We have a small tossed salad with it. Of course, it’s great with a grilled pork chop! But, a lot of times we go no-meat and have the meal with a few almonds for some protein. I make our morning oatmeal in the rice steamer too. I’ve even baked a cake in it twice, and it was certainly edible and not bad. It’s more of a steamed pudding than a cake, I guess. But you can find some interesting recipes online for rice cookers. Lynx: I totally agree, I love my rice cooker, a great investment. But Brenda, make sure if you purchase one that you get the one which has a locking lid. I used to have the other kind and it made a huge mess when I used it. And the steamer basket is so great. My daughter got me a Pampered Chef rice cooker. It is wonderful. You put it in the microwave. I got another one on eBay for our cabin. Around $20. Works for any amount of rice. I use it for boxed rice mixes. Brenda I know you like Trader Joe’s. I recommend their frozen mashed potatoes. They are discs. You put the amount you want in the microwave. They are delicious! My husband likes them as much as my homemade ones! I use my electric rice/vegetable steamer to make hard-boiled eggs. I set mine for 23 minutes, then put them into a bowl of cold water for a couple minutes. I store any not eaten immediately in the refrigerator. They last quite a few days. I have found that allowing the eggs to come to room temperature (or at least a little warmer than straight from the fridge, maybe 20-30 minutes on the counter) ensures they don’t crack while in the steamer. Wow, I need to try this idea of boiled eggs with the rice cooker. And, I haven’t seen one with a locking lid but it would be nice. Depending on what I cook in it, I do get some steam coming from it that has some food residue in it — usually with brown rice. Thanks for the tips, everyone. Sometimes I will have cereal and toast or oatmeal for supper. Maybe I’ll check out the rice cooker, though I don’t know where I’d put it. I love soup and grilled cheese! It’s economical for my larger family. I also utilize fast food specials sometimes! Two for this or that,,,value menu. On a night I’m not planning to cook for some reason, it can be done fairly frugally in a pinch. I make homemade noodles for chicken and noodles or beef and noodles,,,,,,My mama taught me. One cup of flour, one egg and two half eggshells of milk, measured in the egg shell itself, mixed, rolled like a pie shell, and cut into strips which she taught me to dry before using. Very filling. Instant rice can be the base for nearly any protein, and I shop at Aldis as much as possible. A heaping cart there may be 100 dollars, but a heaping cart at Walmart will cost me 150-200. For Frugal Friday themes, I’d love to see a week on saving. Like literally how to save extra money. Dollars, change, jars, using the envelope method? for paying bills? Actual physical management of money. Should I pay myself a small stipend monthly to save for something special? I’ve gone through our house before collecting all of the change. In every drawer, couch cushion, nook and cranny and came up with 110.00 we used for fuel for a summer vacation. Is there better habits of everyone storing in one place? A change jar on the buffet as you enter the house? I didn’t roll the money myself, I used a change conversion machine at Walmart, which takes a pretty good percentage for itself! That wasn’t very frugal!!!!! So I’d soak up anyone’s thrifty ideas of how to best manage funds. I have lunch out at work 1-2 times a week. should I give myself a cash budget for that, and don’t overspend my allowance? I’m not paying very close attention. HELP! I would also be interested in others’ ideas for making a budget and saving! Well, now that I live on social security and live alone, life is actually much easier. Firstly, I do not use any kind of credit and operate on a cash only basis. My car is paid for. I do have car insurance, renters insurance, medical insurance, but that is all besides my rent and utilities. When I get my check, (automatic deposit) the first thing I do is pay all my bills. No matter if they are not due until the end of the month. Then I do my grocery shopping (with a list and I stock a good sized pantry) and refill prescriptions and buy my personal items I need. I also gas my car, and have the oil changed if necessary and get a car wash. This way, I am set for the entire month with no laying awake at night worrying. I also keep a list called: Things I want to Buy. And every month I try to purchase one of those things. Not a need, but a want. I am also a thrift shopper. It is great entertainment as well as a good resource for cheap stuff. You would be amazed at the really nice things people discard. I save a fortune doing this. I also shop Craig’s List for furniture items I want to replace or add. I love to decorate so this is probably my greatest weakness. But I recently purchased beautiful white draperies for my living room at the local Savers, at a 50% off sale and they only cost me $7.99 for a pair. I also keep receipts in a cute little box on my desk. I save all receipts, and write on the top of them what certain item was purchased. That way I can return something if it does not perform well, or sometimes I decide I do not really want it or need it. I periodically clean out the receipt box. I only allow myself to eat out about twice a month with friends. The rest of the time I cook or eat a sandwich. If I have a large purchase coming up, after paying bills etc, I withdraw a certain amount in cash and set it aside to save toward it. I keep it in an envelope in a hidden place. I will not touch this money unless it is an absolute necessity. If you are wanting t save for a great vacation then set aside a certain amount every month as soon as you get paid and don’t touch it. I think the biggest problem many of us face is impulse buying. We tell ourselves we “deserve” it, or we see our friends or family living better than we do and want to keep up. I have had to face that I simply cannot keep up with some of my friends who love to shop Macy’s or Kohl’s. So I do not go there. Learning the Marie Kondo way of living and paring down my possessions and clothing has helped me a great deal. I know look around my home and it feels calm and peaceful. I look back at when I used to have lots of stuff and wonder at how it felt to live in such a large amount of stuff. live is much better now. Simplify all aspects of your life. I am on SS too and do just as you do with bills, etc. I just watched the Marie Kondo series on Netflix and feel too overwhelmed to do the purging all at once as I am alone here! Am working on it though! Ann, start by doing your clothes first. I just took a carload to the local thrift store. Then maybe your linen closet. If you are not organized in the kitchen, it is a big problem. I think the key is to be organized in the first place. I am an organization freak. I am the oldest of nine children and we would have gone crazy if we had not been organized. We were pretty poor, but never ashamed to have company drop in, and our house was always clean and nice. I did not feel poor really. Thanks, Patrice; I have loved all your ideas. I think I am rather well organized but I am trying to downsize from a small house into an apartment eventually. I have depression as well as COPD and some days just don’t feel well so that is why I get overwhelmed sometimes. I just try to plug away it! Patrice, thank you for your incredible ideas. If you save the price of one Starbucks drink each week then you will have three hundred dollars or more in a year. I never go to Starbucks. I’m more of a McDonalds girl for coffee. But rarely do that anymore either. Will add this topic to the list. I love grilled cheese with a can of soup. Pancakes make for a super cheap meal. You can also make a “puff pancake” which is delicious, cheap and baked in the oven! Add some strawberries and whipped cream if you like! I’d completely forgotten about pancakes and let’s not forget French toast. Thank you! Sounds delicious! I like breakfast food any time. Brenda, even with all the meals I make, sometimes my mind goes blank and I cannot think of what to fix for dinner. I have found that making a list of favorite meals and posting it on the side of the refrigerator helps me decide what I am in the mood for that day. I keep most of my recipes on Pinterest, but also have a recipe box on my kitchen counter I get into once in a while. Planning ahead for a week of meals can help and also aid in shopping. Make a chart of the days of the week with three meals/day and make a menu; base your shopping list on this and include leftovers in your menu plan. We do this at the group homes where I work. I already planned to have a future topic be bulk cooking/freezing. For years I’ve kept notebooks (black & white school kind) of daily tasks, appointments, etc. and added dinner meals as well. This relieved my anxiety when money was tight and I was raising my family. I include freezer and pantry items to plan meals for a week at a time or more. It also served as a reference when I needed future meal ideas. This has helped me avoid eating out so much and REALLY is a stress reliever. Usually when I get home on a Friday with the fresh veggies I make a stir fry which is quick and easy(except for the chopping) with pasta on the side with bottled tomato sauce. If I am hungry I will make some garlic toast to go with it. Pampered Chef has a great chopper. Sounds good to me! I love veggies. I buy furniture and other items if needed on Craigslist. I save items not wanted and put an ad on Craigslist and have had success selling things. The items are usually small enough that they fit in my car and I meet the potential buyer somewhere and not have them come to my home. Sorry, I was not thinking and now realize this was supposed to be about recipes. No worries! Still a tip! Absolutely fabulous ideas! Frugal meals are all comfort foods, how funny is that? Food waste is a huge issue for me. It’s literally throwing your money away. I’ll find ways to use up every little scrap! Someone mentioned a puff pancake. That’s a Dutch Baby/Yorkshire Pudding and I make one about 3 times a week. It’s basically a batter of milk, eggs and flour then baked in the oven. (I use a toaster oven). Cans of evaporated milk are a staple here and it’s perfect if fresh milk is unavailable. Can be made sweet or savory, plain or with all sorts of odds and ends from your fridge/pantry. Frozen fruit like peaches or blueberries, or sliced fresh apples that are on the verge. Sprinkled with cinnamon and topped with butter, syrup or nothing at all. For breakfast, it’s like a pancake/crepe/French toast concoction. Plus, it holds well in the fridge for days. Cook once, eat thrice! A savory version might have some cheese, leftover meat like ham or roast and spices. Mac and cheese from scratch is too simple not to make and a great way to use up milk ready to expire. Boil your pasta gently in the milk (half milk half water works well) until tender and the milk is thick and saucy. Add scraps/ends/shreds of cheese and let it melt. Season to taste. So good and creamy, fast and easy. I’ve never even heard of a puff pancake until today! Example: After the holidays I found a $48 spiral-sliced ham marked down to $10, well w/in the “buy by date”. First meal was traditional ham dinner. Next came slices for sammys for several lunches. Additional slices were frozen for four more meals (for 2 adults). These are great for breakfast! Now we are beyond those precise slices so ham is diced up to add to a box of julienne potatoes. Additional baggies of diced ham are frozen for a later repeat or for a delicious ham/swiss quiche or to add to scrambled eggs. And let us not forget the ham bone, tucked away in the freezer for a future meal of ham and beans. Another tip: Any leftover beef roast or chicken is always used one way or another. But sometimes you get down to such small pickings you may not think it worth it. Dice these up and freeze to add to canned soup. Most canned soup anymore is a bit lacking and we sometimes just want to “forget-about-it”. Canned soup when on sale can be an excellent budget saver and adding extra meat can amp it up. I even dice up a leftover sausage patty from breakfast into a can of Italian wedding soup. Hubs laughs at me all the time when I get real down and frugal. Example: Eight sausage patties (12 oz. package) marked down to $1.50 made us one breakfast (w/ waffles that were a steal-box of 10 as part of a buy 10 items and each then only $1 and 11th item free), another breakfast of sammys w/ leftover “Grands” rolls from prev. night’s supper w/ a slice of cheddar cheese.. And still one patty left which I diced up into a can of soup for one of his late worknight suppers. Two meals for two plus one meal for one from that $1.50 package of sausage patties! Yes rice and beans has been my favorite go to for a frugal meals. And also chili . Since we are empty nesters a big pot of chili will make 3 meals for us. I need to find a chili recipe I like. I can’t take much in the way of spicy ingredients or spices. Look for sweet chili recipes. They will have less spices. I love bulk cooking especially since I’m still working and I bring both my breakfast and lunch to the office. Breakfast for me is oatmeal with pecan or walnuts and pepitas or some type of fruit; the fiber in the oatmeal fills me up until lunch. I try and keep two or three of these dishes in the freezer in individual containers so I don’t get bored: Split Pea Soup, Chicken Tortilla Soup, Seven Bean Soup, Cabbage Sausage, Beef Stew, Turkey Chili, Gumbo and Vegetable Soup. Seven bean soup is super easy and cheap: purchase seven different cans of beans (generic – lima/pinto/kidney (light and dark)/northern/garbanzo), open the cans and pour the contents into a pot (include the juice). I like to buy a small ham steak and dice it up and throw it in as well. You simply heat it up and you have yourself a hearty meal. Brenda, I know you only have your small freezer in your fridge, but you can freeze items in some ziploc bags, laying them flat and you’d be amazed at how much you can get in your freezer. I also will make cornbread and freeze it as well. I love everyone’s ideas and probably will be stealing some for myself. Have a great weekend everyone and let’s see more photos of Charlie and Ivy Lou. If there are enough people who do bulk cooking, we can have that topic in the future. I buy a box of red beans and rice mix from Aldi’s, cook that up, and add half a cut up polish sausage to it when done. Very fast and cheap! Thanks! Don’t know where I’d even put it in the bedroom. Wow, that’s not much space for that many people. As a subject for future frugal topics, how about one on how to afford to have a cat or dog? Also, after you think you can pay for its care, how do you decide which dog or cat to get? These are all such great tips and recipes. I love your simple recipe for mac and cheese, Kelli and I’ll try it. I often make a huge pot of vegetable soup using whatever veggies I have in the fridge along with beans and some form of small pasta. For the base I use canned chopped tomatoes and chicken broth. It gives me about 7 meals. (I freeze it in portions.) I also make chili frequently. I love to top spaghetti with chili. Since I’m now alone, I have to admit that I am sometimes happy with a bowl of cereal with a sliced banana and milk! For breakfast I have oatmeal with cinnamon and maple syrup, which I make the night before. This is tasty and quick on the days that I work. On mornings when I’m home I make a 3 egg omelet with toast. I eat half the omelet and have the other half the next day. My issue is that not only do I have a need and desire to keep my meals simple, but with a limited budget, I have to be careful that I buy the most nutritional food inexpensively. I have a chest freezer and that allows me to stock up when things are on sale. I like the idea of saving and budgeting as a Friday topic. Also the idea of costs of caring for a pet. Thanks, Brenda, for taking these discussions on your blog. I find it really helpful. It’s sure helping me too. We have two folks in the house with celiac disease so we have to prepare meals with no gluten (wheat, malt, and barley mostly). The gluten free substitutes are expensive, but we do what we have to do! What we have discovered, however is Mexican food. Oh my goodness! So many great ideas. I will need to read this post and the comments several times and take notes or just print the information. What a great post and thanks to all for sharing. I just realized I posted my pantry way up the posts, so those who are interested need to search way up towards the top. Sorry! I was gone all afternoon and did not see the request until a while ago. Another vote for the rotisserie chicken. They are more expensive here, so I buy the one that’s on sale. Minimum 4 meals (lunches and dinners) plus a serving for the freezer. Leftover juices and bones go into a freezer bag for homemade stock when it’s full. Wild caught salmon is expensive, so I buy it in the can. Kind of a pain to remove bones and skin, but it makes four salmon patties – four meals. I love eggs and eat them often. In fact, they were a diet mainstay when I was in college (so many years ago). When you make a shopping list, make sure you have what you need for however many meals you have to cover during the week. I take lunch to work every day, usually a salad that provides a couple servings of vegetables. If you have a Sprouts in your area, they have really good prices on produce. As an older single person now working one job instead of two, I have recently begun setting up a small pantry. My biggest concern it how to keep track so everything is current. I don’t want to feel I have a good supply but find most of the items have passed their expiration date. Any suggestions, please? before it goes bad. It’s key to frequently evaluate what you have, and adjust your menu and purchases as necessary. Hope that helps! Thank you, Stacey. That does help. With the storage I have and buying for one, trying to put new items behind the old has been a problem. It disrupts the way I store things so I know where they are. But . . . you have made me realize I need to work on a system that requires a little work “up front”. I have a 35 mile drive home after I shop and when I get home I felt pretty good that I was now being very organized when putting things away. But I was not stopping to note dates or shelf life at that time. Great idea! Much easier than to try to look into a cabinet and guess what might need to be used. My son came up with a great way of using all the loose coins he had saved for months. Instead of counting & rolling the money himself, or using one of the machines available in stores, he uses the self-check out aisle & pays for his purchases using the change. There is no extra charge for paying this way in the self-checkout & he will actually get his “change” balance given to him in bills instead of more coins. Breakfast for dinner is always a great “go-to” for us and it is inexpensive! 🙂 Hope you had a great weekend! Love and hugs! I make this recipe alot. I live by a very German and Slovak community. You take a head of cabbage, shred it, and fry it in butter till well cooked. You then fry up some bacon or polish sausage. Add to cabbage mixture. Then boil some noodles and put with cabbage/meat mixture. Makes a bunch and is so filling. It feeds us for several days. It is called haluski or haluska. I wait till cabbage goes on sale and bring it home and freeze it. I don’t even steam it before I freeze. It’s fine for soups, etc. Butter because we are farmers is only on our table but if I buy it in the 1# block it is cheaper and, again, I freeze it. Being on the farm I learned that alot can be frozen. I just didn’t get to town. One year when our middle was born it was a month before I left the house due to weather. We ate quite good. HA! I use leftover rice mix it with Hillshire sausage , onion , jalapeno and whatever else I want – sauteed , add egg , fresh diced tomatoes , make a taco with sour cream , salsa , etc. on top and enjoy. This is sooo delicious and the possibilities as to what you can add are numerous. I also love potato, onion, jalapeno tacos – inexpensive and delicious.